Not only is Holy Basil tasty in just about any Thai or Vietnamese dish – turns out it’s an anti-inflammatory, anti-histamine herb that’s as effective as Ranitidine/Zantac at treating H2 (histamine) induced ulcers, preventing mast cell degranulation and anaphylactic shock. How do’you like them apples? 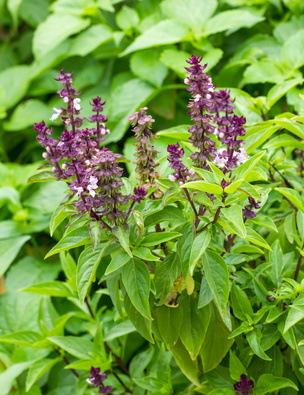 Holy Basil’s activity as an anti-histamine has been found to affect histamine’s H2 receptor, great news for those with histamine intolerance/histaminosis/mastocytosis/mast cell activation disorders with gastrointestinal complaints. I’d be interested to know if it’s anti-inflammatory effects are in part due to it’s high Vitamin K content. Don’t forget that Vitamin K (as I mentioned in this post), is a potent anti-inflammatory, is found in many foods like cauliflower, which is also high in Vitamin C.
“Basophils, mast cells, and their preformed de novo synthesized mediators, play a pivotal role in the pathogenesis of allergic disorders. These molecules are potent vasoactive and bronchoconstrictor agents and they modulate local immune responses and inflammatory cell infiltration (17-18).Immunoglobulin E (IgE)-mediated mast-cell stimulation is an important initial event in the development of type I allergic reactions such as asthma and atopic disorders. Clinical studies have found a close association between asthma and serum IgE levels, as well as IgE-dependent skin test reactivity to allergens. Antigen challenge, in sensitized animals, results in the degranulation of mast cells, which is an important feature of anaphylaxis. O. sanctum ethanolic extract showed marked protection against the mast cell degranulation following antigen challenge in sensitized animals. Mast cell stabilizing activity of extract may be attributed to the presence of anti-inflammatory mediator release, which is known for their mast cell stabilizing potential against antigen-antibody reaction and/or due to the suppression of IgE antibody production, which is responsible for degranulation mast cells. This antianaphylactic and antihistaminic effect may be due to the stabilization of the mast cell membrane, suppression of IgE, and inhibition of pathological effects induced by the release of inflammatory mediators in test extract treated animals. They’re using high amounts of Holy Basil in the studies.What do you think? Would you consider adding Holy Basil to your diet as an anti-inflammatory or histamine blocker to help treat your histamine intolerance, histaminosis, mastocytosis or mast cell activation?